Connie Prince Digital Scrapbooking News: Marvelous Monday winner, sale and a FREEBIE! Marvelous Monday winner, sale and a FREEBIE! I hope the ground hog seeing his shadow which means 6 more weeks of winter didn't get you down! Also congrats to all the Philadelphia Eagle fans on their teams Superbowl win! Congrats are also in order to Sreeves! You won a coupon to Connie's store! She will email you soon! The easiest way to win a coupon to Connie's store is to come by on Wednesday and play our super easy blog game! Don't miss out on the February template bundle! Available at Gingerscraps, the Digichick and Digital Scrapbooking Studio. Today is the last day to get Connie's Buffet collection for 50% off! 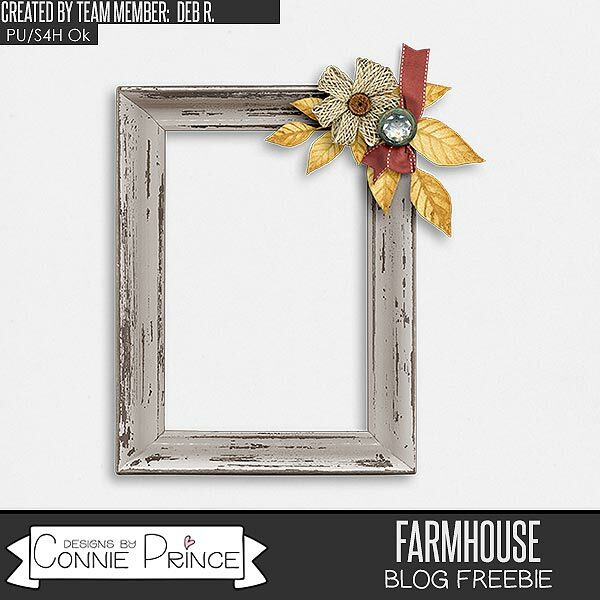 Deb R made you this fabulous frame cluster using Farmhouse!